Homeopathy is the most upcoming scitific method of treatment, based on the nature’s law of Cure, namely ‘Like Cures Like’ with absolutely no side effects. Discovered by a German scientist Dr. Samuel Hahnemann in 1796, and has been verified experimentally and clinically for 200 years. Homeopathy is the revolutionary, natural medical science. 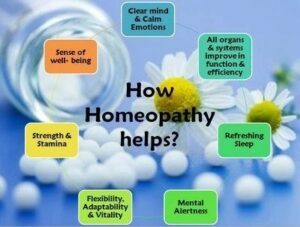 Homeopathy is gentle, safe and effective system of medicine with absolutely no side effects. The remedies are prepared from natural substances to precise standards and work by stimulating the body’s own healing power. homeopathy the first choice of treatment ! Homeopathy is most scientific, logical, safe, quick and extremely effective method of healing . It offers long lasting to permanent cure, treating the disease from its roots cause and not just palliating the symptoms as in other systems of treatment. Homeopathy is one of the most rational sciences with respect to its concepts of health, disease and cure. Homeopathy does not treat the disease but treats the person as a whole on Holistic basis considering his mental, physical, and behavioural symptoms.